In my old age, there are but a few joys left in my life. My afternoon coffee is one. My time alone in the toilet is another. But another joy of mine is getting to talk to you about the Big Lebowski. The Big Lebowski is a movie that’s important because it transcends. It’s a movie that’s appreciated both by college jocks, to female bookworms, to college professors, to budding youths, to sports fans, to Spanish baristas, to American basketballers. It’s the one unifier. The cheese pizza of cinema, if you will. And far be it for me to explain the Big Lebowski to you. The first 10 minutes into this movie I was completely transfixed with it and thoroughly on onboard. And it only took an added viewing to realize there were layers in this movie waiting to be uncovered. I’ve seen it maybe a dozen times (a very low number in the fan spectrum) and I still find new things to find. It’s that kind of movie: infinitely rewatchable. The strange thing about the Big Lebowksi is how it started as a complete underdog and became an absolute cultural phenomenon. You don’t have to love this movie to be able to appreciate it. Gene Siskel didn’t care for it, but Roger Ebert to his credit got it right away. The Big Lebowski, at its heart, is about ordinary people being caught up in extraordinary circumstances. It’s such a simple plot, and it’s characters are in way over their heads, and it’s purposely ridiculous, because our lives themselves can seem over the top and ridiculous. But, there is hope for us. We can adapt and change, and take on our demons and come out on top. We might take our blows in the process, but we grow. We strive to get back to normal, and are happy to do so even if we return with a couple of scars we didn’t have before. The Big Lebowski is the stuff of life. I pity the person who hasn’t seen it yet, and I also envy them for the experience they have ahead of them. Equally wonderful is this deluxe box set and 4K treatment the movie has gotten. What a treat. 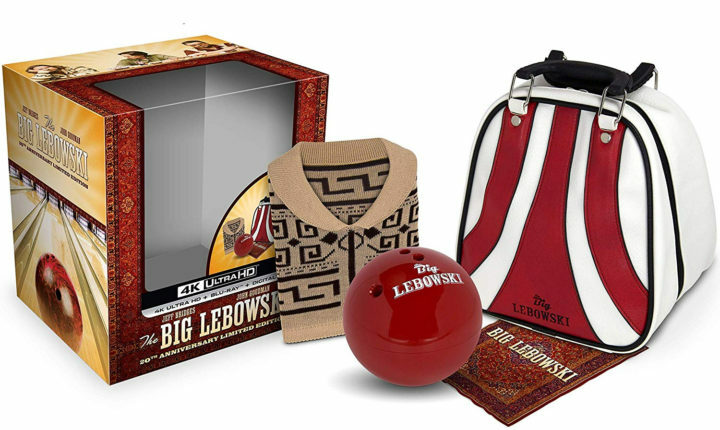 Just look at the strangeness of the packaging: a bowling bag and bowling ball, a rug, and a sweater. The Big Lebowski finally gets the proper 4K treatment that looks lush and sharp and can now finally be archived for future generations to behold. The regular audience won’t get it, but for fans, this just brings a tear to their eye. Well is THE version of the movie. The one that abides.